Ogoh-Ogoh Festival 2018, Hindus Caka New Year Celebration in Lombok! On Friday, March 16, 2018, Hindus celebrated Caka New Year 1940 which is the time for all Hindus around the world held “Nyepi”. In Lombok, a day before celebration thousands of people crowded Pejanggik Street in Cakranegara, Lombok, to watch annual event named Ogoh-Ogoh Festival. 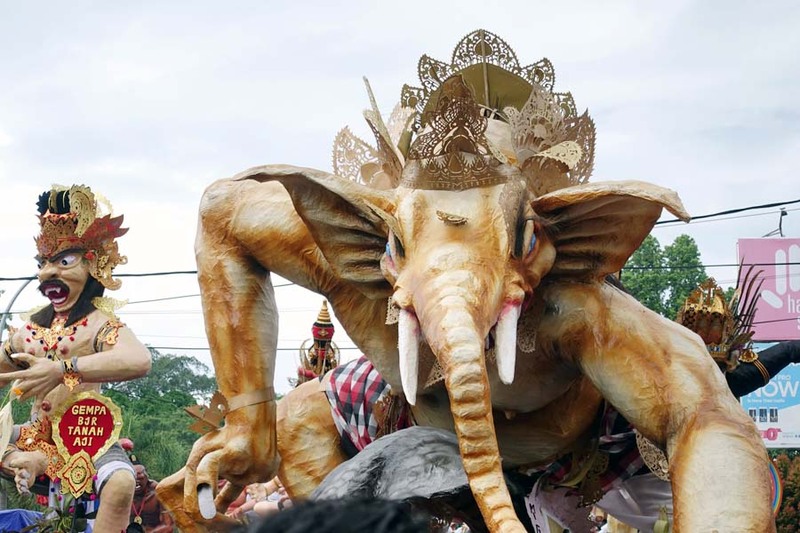 The festival was participated by hundreds of Hindus from Lombok by showing off their Ogoh-Ogoh (giant puppets). The giant puppets were presented in a variety of characters taken from Hindus beliefs such as Ganesha, Wisnu and many more. Dozens of Ogoh-Ogoh gathered in line at Pejanggik Street throughout Jalan Selaparang nearby Meru Temple. Ganesha, a God in Hindus beliefs. Gamelan Bali on the festival. Not only Ogoh-Ogoh being shown on this festival, traditional music and dance also took part. Gamelan Bali and Lombok were sounding in the crowd and created unique and typical music. The music also represented how Lombok and Bali are closely connected with cultures and traditions. Traditional dancers on Ogoh-Ogoh Festival 2018. Traditional Bali dance also participated in this event. Various looks with mixture cultures of Bali and Lombok were represnted in traditional dance. 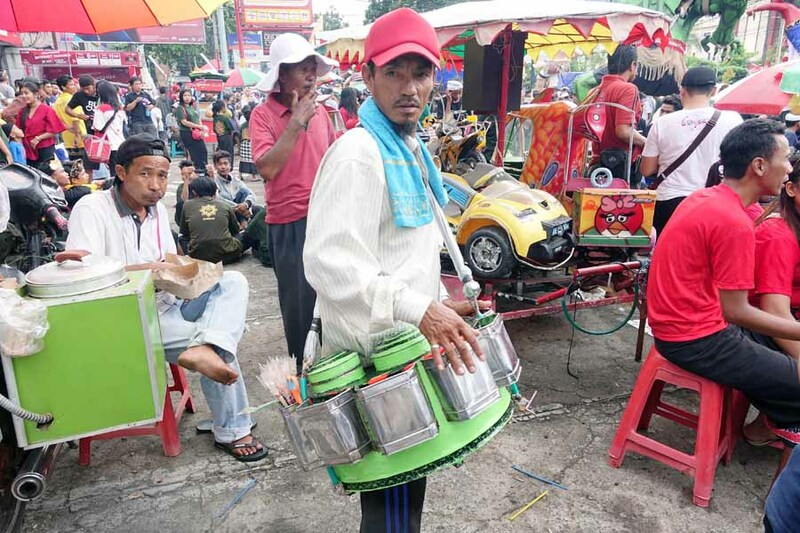 Lombok Traditional sweet candies seller spotted out in the crowd! Amongst the crowd, some street venders also took part. I spotted out an old Lombok traditional food seller. It was “Jaje Bulu Bembeq” which means “hair candies” or “sweet candies”. 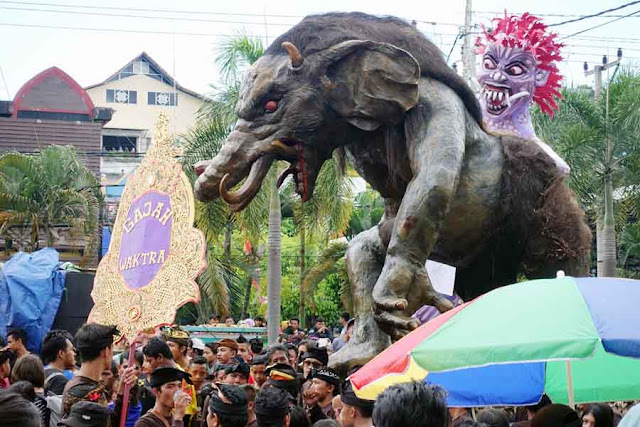 In short, the festival started at 2 pm and walked throughout Pejanggik Street towards the east in Meru Temple. 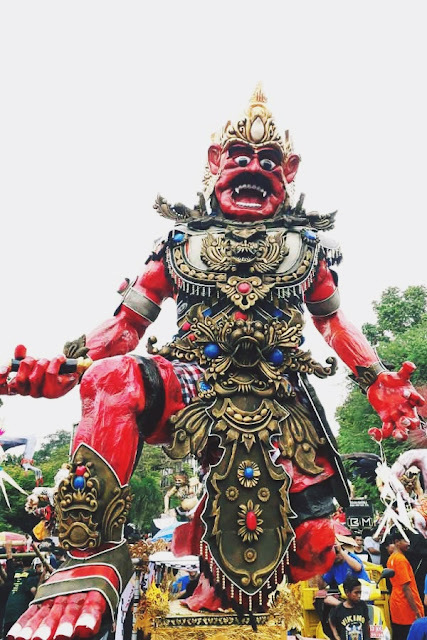 Ogoh-Ogoh Festival is a pre-event before “Nyepi” being held in the late afternoon, usually at 6 pm and for 24 hours.